Hydrolysis of 2-amino phenylpropionitrile by nitrilase is a fundamental biochemical reaction that produces chiral phenylalanine. For practical application of this biochemical reaction, researchers have attempted to improve enzyme enantioselectivity and the reaction rate. The substrate concentration was increased from 100 to 200 mM without substrate inhibition because of the formation of a substrate-hydroxypropyl-β-cyclodextrin (HP-β-CD) complex. Meanwhile, the activity of recombinant nitrilase increased 2.5 times because the addition of HP-β-CD solubilized hydrophobic substrates in the aqueous system. Furthermore, the formation of the substrate-HP-β-CD inclusion improved the enantioselectivity of the enzymatic reaction toward producing l-phenylalanine (l-Phe). The enantiomeric excess (e.e.) value of l-Phe increased from 65% to 83% when the conversion rate reached 50%. The recombinant nitrilase enantioselectively hydrolyzed 2-amino phenylpropionitrile to produce l-Phe. The addition of HP-β-CD to the reaction system enhanced the solubility and bioavailability of hydrophobic substrates as well as the enantioselectivity. The results showed that this additive has potential advantages in biochemical reactions of hydrophobic substrates, particularly for enantioselective biosynthesis. l-Phenylalanine (l-Phe) is an essential amino acid generally used in food industries, human nutrients, and pharmaceuticals. For example, it is a precursor of some anticancer drugs and the dipeptide sweetener aspartame []. In early industrial processes, l-Phe was mainly produced by chemical synthesis. Because of the specific demand for the stereospecific form and the consideration of eco-friendly chemical synthesis, this approach was gradually replaced with bioprocesses, such as microbial fermentation and enzymatic transformation []. Nitrilase (EC 3.5.5.1) is an enzyme that converts nitrile to its carboxylic acid or amide []. Some important chiral pharmaceutical intermediates and bulk products, such as acrylic acid [], (R)-(−)-mandelic acid [], 3-hydroxyvaleric acid [], and nicotinic acid [], are produced by nitrile hydrolysis. For example, (R)-(−)-mandelic acid, widely used for the production of semisynthetic cephalosporins and anti-obesity agents, is produced by hydrolyzing mandelonitrile [,]. In addition, other studies focused on strategic optimizations for increasing the reaction rate, reducing substrate inhibition, and improving enzyme enantioselectivity [–]. Cyclodextrin (CD) is the generic term for cyclic oligosaccharides that are used frequently as host molecules in supramolecular chemistry. Despite the outside of the CD molecule being hydrophilic, CD contains a hydrophobic cavity that entraps most hydrophobic molecules to form inclusion complexes []. Thus, it improves the solubility and bioavailability of hydrophobic compounds. Its use is of interest for reactions in which hydrophobic compounds are to be delivered. In previous reports, CD has been proven to increase the availability of insoluble substrates, reduce substrate inhibition, and enhance the efficiency of catalysis by increasing the reaction rate in other catalytic reactions []. It has also been used in an enzymatic enantioselective reaction to increase the enantiomeric excess (e.e.) value of the product []. In our previous study, a novel nitrilase from Rhodobacter sp. LHS-305 was cloned and expressed in Escherichia coli []. This nitrilase displayed high activity toward both aliphatic and aromatic nitriles, similar to the nitrilase from Rhodococcus rhodochrous ATCC 33278 []. It also showed regioselectivity toward dinitriles to produce cyanocarboxylic acids. Because this nitrilase shows properties different from those of typical nitrilases, it potentially has industrial applications in the future. In this study, the stereoselective hydrolysis of 2-amino phenylpropionitrile by this novel nitrilase was investigated. The influences of CD on this hydrolysis in terms of substrate inhibition and the e.e. value of the product were found to improve the catalytic reaction. The investigations comprehensively increased our knowledge of this unique nitrilase for its application. Hydroxypropyl-β-cyclodextrin (HP-β-CD) (≥98.5%) was purchased from Shanghai Lingfeng Chemical Reagent Company (Shanghai, China), biochemical-grade l-Phe from Sigma-Aldrich (St. Louis, MO, USA), and glucose and other chemicals from Sinopharm Chemical Reagent Co., Ltd. (Shanghai, China). Recombinant E. coli expressing a novel nitrilase gene from Rhodobacter sphaeroides LHS-305 were used in this study. Seed medium (g/L) contained peptone 10, yeast extract 5, and NaCl 10, pH 7.0 to 7.5. Fermentation medium (g/L) contained yeast extract 10, peptone 5, NaCl 5, glucose 3, and MgSO4·7H2O 3, pH 7.0 to 7.5. Media were sterilized for 20 min at 115°C. Precultures cultured in the seed medium for 3 to 4 h at 37°C were inoculated into 100 mL of fermentation medium in a 500-mL Erlenmeyer flask, with the addition of α-lactose (1 g/L), and cultured on a shaker at 200 rpm and 20°C for 12 h.
The recombinant nitrilase was purified by affinity chromatography as described in our previous report []. 2-Amino phenylpropionitrile (73 mg) was added to 100 μL methanol to obtain a 5 M substrate stock solution. The stock solution was added to 50 mM PB solution (pH 7.0) with HP-β-CD and stirred for 20 min at 40°C. This yielded the 2-amino phenylpropionitrile/HP-β-CD inclusion complex. The catalytic reaction was performed in 1 mL of sodium phosphate buffer (50 mM, pH 7.0) containing the substrate 2-amino phenylpropionitrile (20 mM, final concentration) and nitrilase (1 mg/mL, final concentration). Reaction mixtures were incubated at 40°C for 10 min, and reactions were quenched by the addition of 10% (v/v) 1 mol/L HCl. Enzyme activity (U) was defined as the amount of enzyme required for the hydrolysis of l μmol of the 2-amino phenylpropionitrile substrate to the corresponding acid within 1 min. All experiments were performed in triplicate. The enantiomeric purity of Phe was determined by reversed-phase HPLC (Agilent, Santa Clara, CA, USA) equipped with a Chirobiotic T column (Sigma-Aldrich Co.) at a flow rate of 0.5 mL/min with a solvent system (75:25, v/v) of phosphate buffer (25 mM, adjusted to pH 3.5 with H3PO4) and methanol. Peaks were detected using an ultraviolet detector at 210 nm. SDS-PAGE for the purified nitrilase indicated a single band at 40 kDa, naturally corresponding to 14 subunits of identical size []. The optimal reaction pH and temperature of the purified nitrilase were 7.0 and 40°C, respectively []. In the hydrolysis of 2-amino phenylpropionitrile to l-Phe by the purified nitrilase, the reaction rate was limited by the low solubility of 2-amino phenylpropionitrile. HP-β-CD can form a complex with hydrophobic substrates. It may enhance the solubility and bioavailability of such compounds. 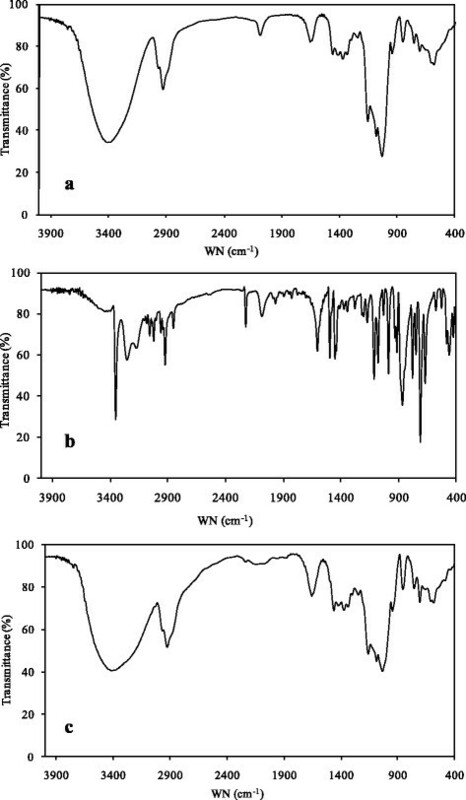 The diminished transmittances of the cyano group at 2,240 to 2,222 cm−1 by infrared spectrometry indicated that the substrate molecule had been included by HP-β-CD, as shown in Figure 1. 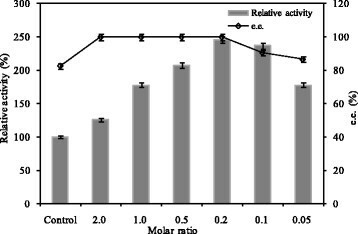 The effects of HP-β-CD/substrate molar ratios on enzyme activity were examined, as shown in Figure 2. The reaction rate was improved significantly by the addition of HP-β-CD, consistent with a previous study in which HP-β-CD was used as a solubilizer []. The highest relative activity (245%) was obtained at a ratio of 0.2. However, the host-guest complex was present in a dynamic equilibrium with free substrates and the inclusion complex. The concentration of free substrates decreased with the increase in CD available for enzymatic attack. Meanwhile, HP-β-CD addition also affected the e.e. value of the product. As shown in Figure 2, the e.e. value of the product decreased when the ratio was lower than 0.2. These results showed that the HP-β-CD/substrate ratio was a sensitive parameter affecting the reaction rate and the enantiopurity of the product. The optimum HP-β-CD/substrate ratio of 0.2 was selected in subsequent experiments. Infrared spectroscopy of the HP-β-CD, substrate, and HP-β-CD-substrate inclusion complex. (a) Spectroscopy of HP-β-CD. (b) Spectroscopy of substrate. (c) Spectroscopy of HP-β-CD-substrate inclusions. Effect of the HP-β-CD/substrate molar ratio on the catalytic reaction. Reactions were carried out in 50 mM sodium phosphate buffer (pH 7.0) at 40°C with a substrate concentration of 20 mM. 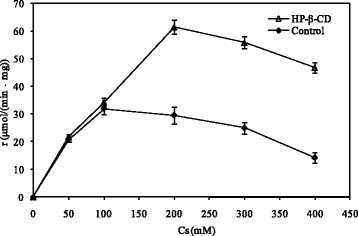 HP-β-CD was added according to the molar HP-β-CD/substrate ratio (0.05 to 2.0). The relative activity was tested when the reaction had proceeded for 10 min, and the e.e. value was determined when the conversion rate reached 40%. The actual activity at 100% was 33.8 U/mL. The inhibitory effects of substrates with or without HP-β-CD were investigated, as shown in Figure 3. Significant substrate inhibition was observed, and the initial reaction rate decreased correspondingly as substrate concentration exceeded 100 mM without the addition of HP-β-CD. It was necessary to eliminate the inhibitory effect of substrate on recombinant nitrilase activity in this biotransformation. Substrate inhibition was reduced by the toluene-water biphasic system or in situ production removal by the addition of resin [,]. Here, the substrate inhibition was effectively reduced by addition of HP-β-CD in the reaction system. HP-β-CD could form host-guest complexes with hydrophobic substrates. The CD-substrate inclusion complex can function as a reservoir to slowly and continuously release free substrate for the enzymatic reaction. After the substrate was allowed to interact with HP-β-CD, substrate concentration for the maximum initial rate increased from 100 to 200 mM. The maximum initial rate increased from 32 μmol/(min·mg) at a substrate concentration of 100 mM to 62 μmol/(min·mg) at a substrate concentration of 200 mM. The reaction time at which the conversion rate reached 50% was shortened to 9 h at a substrate concentration of 200 mM in the presence of HP-β-CD, as shown in Figure 4. 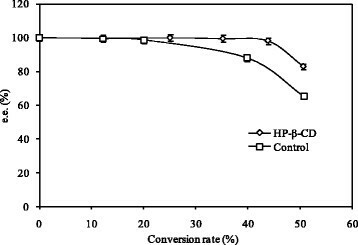 The HP-β-CD-substrate reaction system greatly increased the bioprocess efficiency. Substrate concentration against initial rate of reaction with and without HP-β-CD which was catalyzed by nitrilase. Reactions were carried out for 10 min in 50 mM sodium phosphate buffer (pH 7.0) at 40°C. A constant molar HP-β-CD/substrate ratio of 0.2 was applied. Time course of the biotransformation process. Reactions were carried out in 50 mM sodium phosphate buffer (pH 7.0) at 40°C with a substrate concentration of 200 mM. A constant molar HP-β-CD/substrate ratio of 0.2 was applied. Enantiomerically pure α-hydroxy carboxylic acid or amino acid can be produced by the enzymatic hydrolysis of the cyano group and transesterification or the hydrolysis of an ester group []. The recombinant nitrilase enantioselectively hydrolyzed racemic 2-amino phenylpropionitrile to l-Phe. However, the e.e. value of the product was only 65% when the conversion rate reached 50% with a substrate concentration of 200 mM. In previous approaches, CDs were used for chiral separation of enantiomer and the enhancement of enantioselectivity in an enzymatic reaction by the formation of CD-substrate inclusion complexes [,]. When HP-β-CD was added to the system to create an inclusion complex, the e.e. value of the product increased to 83% when the conversion rate reached 50%, as shown in Figure 5. Although the e.e. value of the product decreased with the increasing conversion rate, an e.e. value of 99% for the product was obtained when the biotransformation rate reached 40% after 5 h of hydrolysis, and the E value was 254 under these optimal reaction conditions. The results showed that the catalytic asymmetric synthesis of l-Phe by the recombinant nitrilase is a typical dynamic kinetic reaction favoring the d or l enantiomer. We inferred that the d type more readily formed inclusion complexes with HP-β-CD because of the difference in molecular recognition of enantiomer []. The d type was contained within the hydrophobic cavity, and the l type was free outside the hydrophobic cavity and was exposed to enzymatic attack. Consequently, the hydrophobic cavity protected and suppressed the hydrolysis of the d enantiomer and led to the enantioselective hydrolysis of an enantiomeric molecule. The e . e . value of the product catalyzed by nitrilase with or without HP-β-CD. Reactions were carried out in 50 mM sodium phosphate buffer (pH 7.0) at 40°C with a substrate concentration of 200 mM. A constant molar HP-β-CD/substrate ratio of 0.2 was applied. The recombinant nitrilase enantioselectively hydrolyzed 2-amino phenylpropionitrile to produce l-Phe. 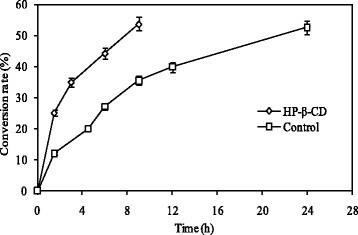 Using the HP-β-CD-substrate reaction system, the reaction rate was greatly improved by enhancing the solubility and bioavailability of the hydrophobic substrate. Meanwhile, the e.e. value of the product was also improved significantly because of the formation of inclusion complexes. In this manner, HP-β-CD enhanced both the efficiency of the catalytic reaction and the optical purity of the product. The properties of CDs to form inclusion complexes with hydrophobic molecules led to their practical application in a biochemical reaction with a hydrophobic substrate. In particular, they were used to promote enantioselective biosynthesis. We thank Guinan Li and Hualei Wang who provided the fundamental works, such as clone and expression of the novel nitrilase in E. coli. We hold a Chinese patent relating to the content of the manuscript. The ownership of the patent belongs to East China University of Science and Technology. MYL carried out the biotransformation process design, product analysis, and data processing. XDW conceived the study, participated in its design and coordination, and helped to draft the manuscript. Both authors read and approved the final manuscript.